SnorePro – Peace in the Bedroom at Last? I don't snore. I may have snored in the past, but I don't now. This knowledge comes from my use (albeit limited) of HBI's SnorePro SP-600, a gadget the company calls a "snore counter and biofeedback device." And by snore counter they don't mean the part of the store where you buy the thing; they say it actually keeps track of the number of times your body emits outboard motor noises during the night (as if you really want to know!). I couldn't resist trying such a product. My wife claims that I snore sometimes, particularly if I've been quaffing a few. Of course I'd never tell her that she snores; she thinks it's just a guy thing and I'd hate to burst that balloon. Apparently, the SnorePro makers think the same thing; the SP-600's box has a picture on it of a poor, downtrodden woman pulling her pillow around her ears while her "insignificant extra" serenades the dead. Anyway, this seemed like an interesting opportunity to find out one way or the other if I truly do snore, so I hit up the SnorePro folks for a sample. And now I know I don't snore, and happy, happy, joy, joy for that! Either that, or the SnorePro doesn't work. The company says the SP-600 uses proprietary Dynamic Snore Detection (DSD) technology (not to be confused with a microphone) to detect snores and gently issue a programmable digital pulse to prevent snoring. Kind of like a defibrillator, I guess, but hopefully more gentle. Here's what the press release said: "The digital pulse functions like a spouse by nudging their snoring bedmate, which in turn trains the body to change sleep positions to eliminate the snoring." That's all I need, a virtual wife to augment the real thing. HBI claims that the unlucky and unhappy bedmates of people who snore lose "an average of one hour of sleep per night due to snoring." The idea is that, instead of the snoree being bothered, it's better to jolt the snoror and ruin his/her/its sleep rather than forcing the snoree to roll over and nudge the snoror manually. So what we have here, apparently, is a surrogate nudger. The SnorePro SP-600 is worn on your wrist, reminding me of a blood pressure monitor we have (which doesn't work either, 'cause it always tells me my pressure's higher than it should be. What's with all these gadgets?). It has a built-in LCD screen that supposedly displays your (or your snoror's) snore history and lets you track how much your snoring improves over time – by which I assume they don't mean how much more musical your snores get. The company says the SP-600 can also "help identify and address external factors such as sleep position or consumption of alcohol/cigarettes, which are often responsible for increased snoring." 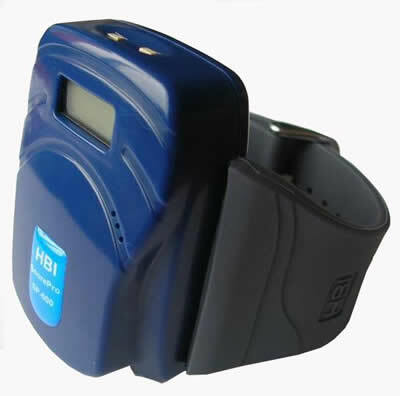 It features an adjustable threshold (in which the snore intensity is measured in decibels and filtered against established background noise before it tasers you with its pulse). There's also a "3-2-1 Training Program" that, at the beginner level (people just learning to snore, I suppose) takes three continuous snores to activate the pulse. "When the snore history shows improvement, users are ready for the next level." The Intermediate level activates with two continuous snores and the Advanced level (which the company says may be too severe and disturbing for a beginner) fires up at the first snore. 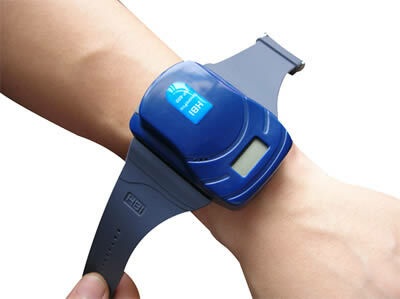 You don't have to use the taseresque aspect, which requires you to put a little sensor (or "sen-snore") on the unit where it touches your wrist. You can merely track your or your spouse's snoring, which could perhaps be handy if you're looking for evidence in the divorce proceedings. I chose to go the full meal deal method, saying mentally "Okay, SnorePro, bring it on!". To help ensure a fair test, I went out with a friend and pounded back a few. Hey, it was for science! Once I figured I had a head start on my head starting to buzz like a hive of angry bees once I hit the sack, I put on the SnorePro and slipped under the covers anticipating a damning readout the next day. But I got bupkis. And I didn't feel any "stimulation" from the unit in the way of surrogate nudges not, perhaps, that I would've noticed them once I was ensconced firmly in slumberland (I sleep deeply). I tried it again a few nights later without the alcoholic stimulation, thinking that perhaps I was more passed out than sleeping during the previous test and that I might need to be a little more conscious to feel the stimulation. Okay, I only tried it twice, but there's good reason for that. A major reason is that the darn thing feels intrusive on the wrist. It's about one inch by two inches by half an inch in size, which is much bigger than my wristwatch, and I didn't like how it felt. What was worse was that, while it isn't particularly heavy, its bulk could cause its own share of marital troubles. You see, I often roll over during the night and I like to put my arm around my dear wife, who sleeps to my right. Since I preferred the SnorePro on my left wrist, I risked bashing her with it when I reached around to cuddle. I ask you: which is worse for my darling lady, a "little night music" or being slapped upside the head by the surrogate nudger? I know which she chose because I asked her. And that was the last time I wore the SP-600. Bless my wife's dear heart! The product may very well work, and it may very well work very well. But it didn't work in my test environment and I can't lie to you, dear readers, by saying otherwise. I guess it could also have been operator error, but I'm reluctant to admit that possibility. Perhaps more testing would find that "sour sport" where I snore and it notices, but I'm not going to risk giving the love of my life unnecessary lumps just to write a column. Maybe I'll just stay away from the booze. Nah, that won't happen either. It's a darn good thing she loves me! The SnorePro SP-600 retails for $119.99.